Tech at Night: Edward Snowden making stuff up to help Glenn Greenwald? FCC Reform comes to the Senate. Tech at Night: Bitcoin zealots freak out. 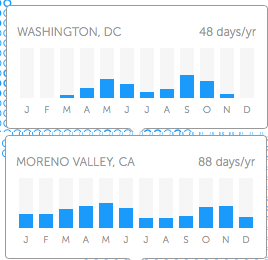 And note that it’s actually worse than this: Moreno Valley’s down months from June to September are due to a dry heat, which to me is infinitely better than DC/Arlington’s frozen winters and less warm but wet summers.